Every day in the United States, 10,000 people turn 65 years old, and studies show that a vast majority of them want to remain at home as they age. The problem is that 26.1 million adults aged 65 and older have at least one limitation in their daily activities, whether that’s dressing or feeding themselves or using the bathroom or managing their medications or preparing their own meals. Nursing homes, and assisted living facilities, are one option as a safe environment as one ages and becomes less able to take care of oneself. But researchers at the Johns Hopkins schools of nursing, medicine and public health have developed and tested another option, one that allows individuals to remain at home, remain functional, and remain safe. The Community Aging in Place—Advancing Better Living for Elders program (CAPABLE) is a multi-component, low-cost program designed to keep more seniors safely in their homes as long as possible. The program integrates a registered nurse, an occupational therapist, and a licensed handyman. 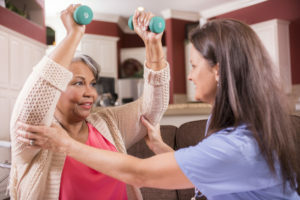 Over the course of five months, the OT and RN work with each participant to identify their physical limitations and establish individualized self-care goals. The OT’s environmental assessment identifies for the handyman those safety concerns that need fixing. CAPABLE, which could be offered nationally to all Medicaid recipients under a provision of the Affordable Care Act, costs approximately $3,300 per participant for four months including up to $1,200 in home repairs. The average cost for two weeks in a nursing home is about $3,500 and according to AHRQ, the cost of an average 1-week hospitalization for patients 65 to 84 years old is $13,000. The CAPABLE Training package consists of e-learning modules for OTs—which includes information on how to integrate the handyman into the care team—and RNs. These are supplemented by CAPABLE Workshops offered quarterly at Johns Hopkins, in Baltimore, or scheduled by special arrangement at your facility. The larger goal of CAPABLE is to provide all older adults the opportunity to take care of themselves so that they can focus on individual, family or community activities most meaningful to them.